Sometimes, life’s a real witch. Allie’s sleepy life is abruptly turned upside down when she’s attacked by a dead man wearing a policeman’s uniform. A decades old spell cast by her mother that eliminated shape-shifting from the world is being chipped away at, awakening Allie to the true depths of her magical powers…Powers she didn’t know she had, isn’t sure she wants, and sure as heck doesn’t know how to control. But even if she isn’t ready to be a witch, dark forces from her family’s past are ready to slaughter her and plunge humanity into a new Dark Age, one that will bring hungry shapeshifters back into the world of man. 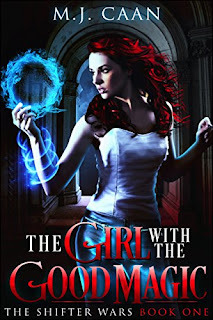 Allie’s untapped abilities could save mankind, or they could threaten to set a war in motion--a war that could tip the balance of supernatural power in our world forever. Even with the help of a handsome, flirty police officer at her side- one with more than a few secrets of his own- Allie is one miscast spell away from dooming mankind. Supernatural creatures are starting to go bump in the night. Now Allie Is forced to learn how to bump back.